Joey joined Alona Divers in September 2015. As the Managing Partner, he makes sure all your diving needs are complete. A “Hands-On Operator” and likewise a Divemaster, he empowers and supports the entire Team in all aspects -taking safety measures, taking pictures, arranging schedules, etc.- making sure that it would be a wonderful experience for the guests. Mumu is a PADI Master Scuba Diver Trainer who speaks Mandarin and Cantonese. As an instructor, she is rated as one of the best in the area. This pretty Chinese has a very good track record in the industry.Mumu is married to Raphael, a Swiss national and they have a cute son named Diego. The older brother of Retto, Alona Divers’ boat builder, Efren is an experienced, yet very humble Boat Captain. He is a “relaxed” but competent and soft-spoken person. Often called Jack Sparrow, Lutoy has been working as a Divemaster since 1992 and is an excellent macro spotter. He is also a “clown”, always cracking jokes with his “Carabao English” humor, which always gives everyone a great laugh. Back with 23 years Of industry experience. Is the wife of the late Peter Buermann, founder of Alona Divers. Tess Loves Dogs and is a Good Cook. She prepares pack meals for divers upon request and still enjoy working and managing the diveshop up this time. Dondon is a PADI Master Scuba Diver Trainer. Following the footsteps of his elder brother “The Great Darwin Menorias” who now heads the Coastal Resource Management in Panglao and was one of the pinoneer PADI Instructors in Bohol, Dondon is likewise as passionate and knowledgable when it comes to diving. Quality Teaching is his brand name.He came home to Bohol after working as a PADI Instructor at the Atlantis Resort in Dubai. Dondon is married to Tata. Their son Enzo is also a diver and is fast becoming like his father. Always gives “Joy and Laughter” in the diveshop. 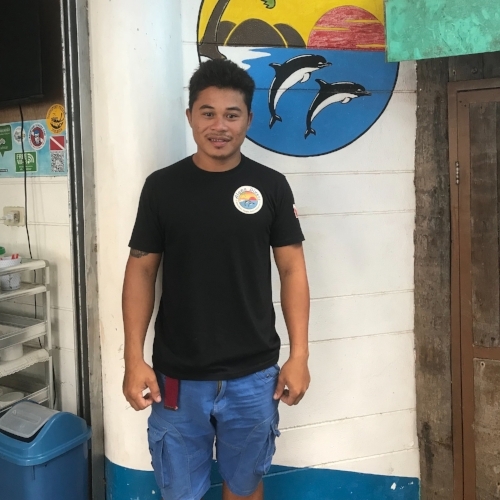 Manny is also a “joker”, but loves to start early morning and is first of all, a very responsible Divemaster. He loves to take photos of the dive with his GoPro, which he always carries with him. Not only for his own, but likewise for the divers’ benefit, which he generously shares for free. The tandem of Joy & Jane greets customers with a smile and warm welcome; addressing all inquiries for “walk-ins” and providing good customer service. An “all around crew” with a good attitude and in full support of the Team, PJ was recently confirmed as a Padi Divemaster. He is also good cook, with a skill of preparing nice fruits and food presentations onboard. Er-Er is a quiet type of guy. He is a good dive master who alternates as compressor-man, refills tanks and likewise a speed-boat driver/operator. He is Alona Divers’ “Main Guy”. He was trained by the late Peter Buermann and a very good macro spotter, regulator technician, compressor-man and speedboat operator. Always smiling, Jun-Jun is very humble and friendly. He is often requested by returning guests.